Discover the best of Swan River Cruising with Captain Cook Cruises. 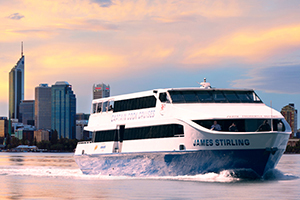 Take in the wonderful sights that can only be viewed from the Swan River as you cruise the calm waters between Perth and Fremantle. From social club outings, to school formals and even wedding receptions, Captain Cook Cruises can cater for groups anywhere from 50 to 350 passengers. Whether it is a full day, half day or private charter experience Captain Cook Cruises has the perfect cruises for you.